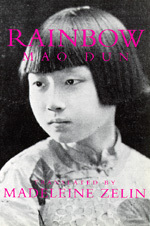 With this translation of the 1929 novel Rainbow(Hong), one of China's most influential works of fiction is at last available in English. Rainbow chronicles the political and social disruptions in China during the early years of the twentieth century. Inspired by the iconoclasm of the "May Fourth Movement," the heroine, Mei, embarks on a journey that takes her from the limitations of the traditional family to a discovery of the new, "modern" values of individualism, sexual equality, and political responsibility. The novel moves with Mei from the conservative world of China's interior provinces down the Yangtze River to Shanghai, where she discovers the turbulent political environment of China's most modern city. Mao Dun writes with the conviction of one who has lived through the events he is describing. Rainbow provides a moving introduction to the contradictions inherent in the simultaneous quest for personal freedom and national strengthening. Vividly evocative of the period in which it was written, it is equally relevant to the China of today. Shen Yanbing (1896-1981), better known by the pen name Mao Dun, was a member of the generation that created a truly vernacular Chinese literature in the early twentieth century. After the founding of the People's Republic of China in 1949, he was named Minister of Culture. Madeleine Zelin is Professor of Chinese History and East Asian Languages and Cultures at Columbia University. She is the author of The Magistrate's Tael (California, 1984).